When Whitten Architects was commissioned to design a 3,000-square-foot residence for a family of four on Mere Point, the site-specific design strategies utilized by architect Eric Laszlo not only blended the home into the landscape but also increased the home’s energy efficiency. Q. WHAT IS SITE-SPECIFIC DESIGN? A. Site-specific design begins with a careful analysis of a chosen site, its prominent geographic features, and all existing climatic influences. These influences may include views (both into and out of the site), prevailing wind patterns, and solar orientation and exposure, as well as existing drainage patterns and vegetation features. Q. HOW WAS SITE-SPECIFIC DESIGN USED AT THE MERE POINT LOCATION? A. Strategies included designing the architectural forms and spaces for an east− west axis, utilizing high-efficiency glazing along the building’s façade, and providing exterior-grade access at both the main level and a lower-level walkout basement. This allowed us to take advantage of the prevailing breezes for passive summer cooling and capture passive winter heating with the large south-facing windows, while deep overhangs prevent summertime heat gains. An additional design strategy incorporated glazing units in every primary room. This provides balanced natural lighting throughout the day, which in turn helps minimize the use of artificial lighting. Q. HOW DID THE LANDSCAPE INFLUENCE THE DESIGN OF THIS HOME? A. The open floor plan is designed to allow unimpeded views through the interior spaces to the landscape and water beyond. There are also numerous points of access to the surrounding landscape, reinforcing the indoor/outdoor living theme and allowing the landscape to “wrap” around the building. Furthermore, regionally quarried stone was used in the retaining walls and exterior stone pavers to lend a sense of seamlessness between the hardscape and the undisturbed natural landscape. Q. WHAT ARE THE ENERGY BENEFITS OF SITE-SPECIFIC DESIGN FOR THIS PROJECT? A. The primary benefit is its orientation for passive heating and cooling. As well, the building envelope utilizes closed-foam urethane insulation resulting in R-24 walls and a R 49 roof that exceed minimum Maine state energy code requirements. 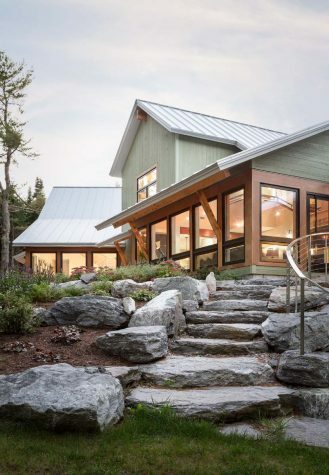 The exterior forms not only blend into the landscape but utilize low-maintenance, high-durability materials that include wood siding with a 30-year warranty and a standing-seam metal roof system.